Nichelle Nichols is famous for playing Star Trek's Lieutenant Uhura on the starship USS Enterprise NCC 1701. Today our Star of Freedom celebrates her 81st birthday. Doesn't she look awesome! 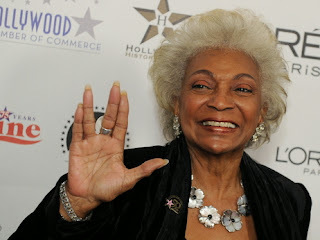 Broadcast throughout the galaxy on our tv's, our beloved Communications Officer always kept the Enterprise's hailing frequencies open, alerting the bridgecrew keeping them safe from danger. Correctly establishing incoming and outgoing communications was so crucial for making first contact with alien worlds. 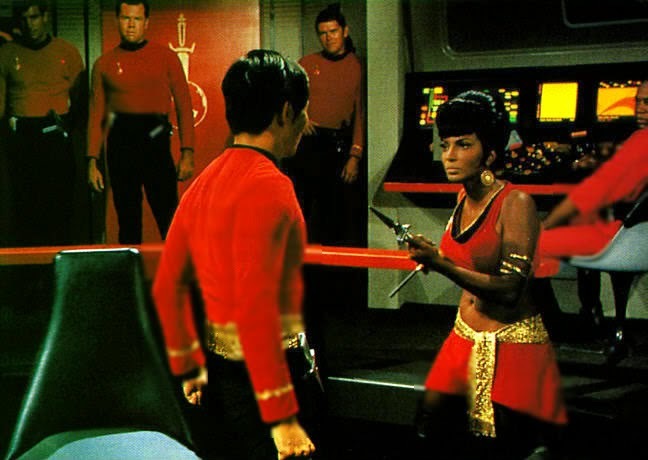 Remember how Uhura distracted Sulu in Mirror, Mirror? 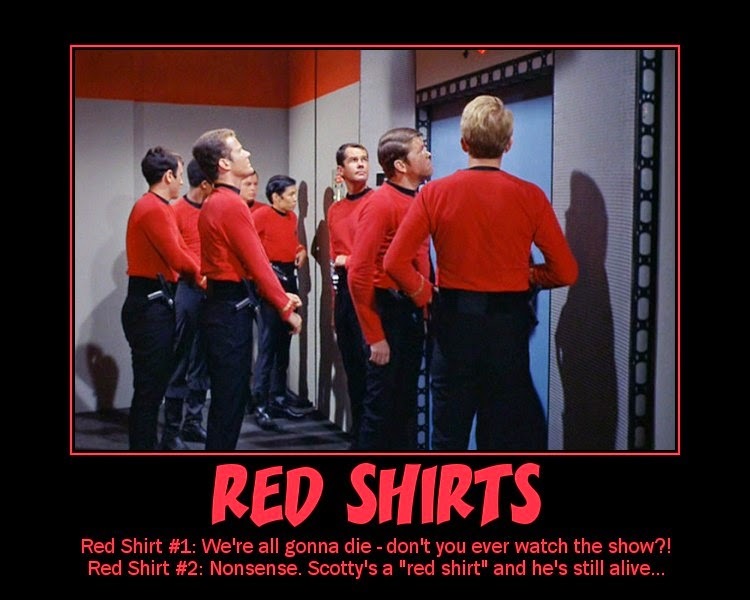 In keeping with the seasons festive spirits, why don't we celebrate Star Trek's itchy trigger finger 'Red Shirts' with a burst of nostalgia. Many of us already know, the curse of the Redshirt began with Captain Kirk's five year mission enforcing peace in the galaxy, firing phasers first and asking questions later. Fans know that the USS Enterprise NCC 1701 has standing orders to investigate all interstellar phenomena wherever they may be which is totally cool. Kirk's starship has afterall an endless supply of 'marines' to serve and protect which is really neat. 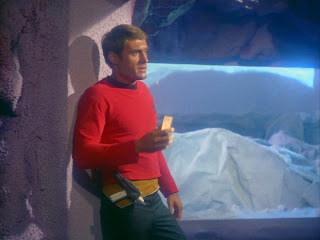 When things get dicey, Kirk calls in the 'Red Shirts' to scope out mystery alien planets etc just in case. Which usually pays off big time until you add the fatalities up. 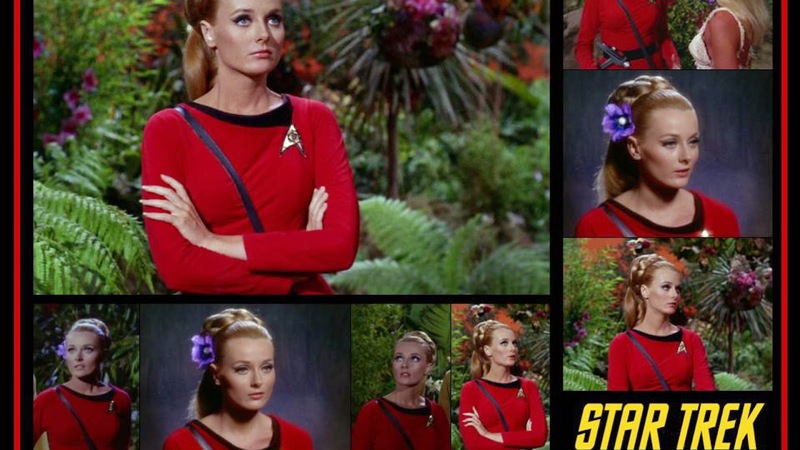 : At the start of Star Trek TOS, the USS Enterprise NCC 1701 had a Starfleet family of 430 men and women. Remember Rayborne? Poor fellow was assigned as a security guard to protect Kirk's Enterprise. 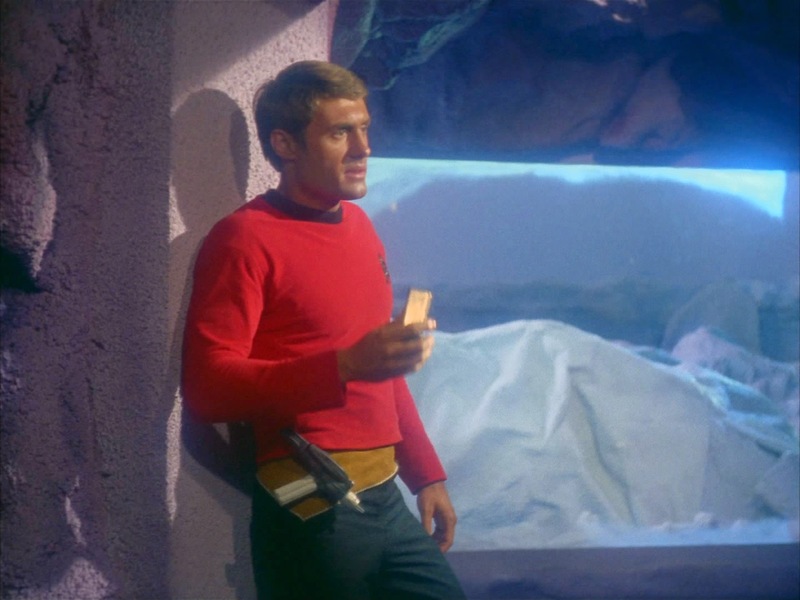 While on a landing detail to Exo III, Raybourne is left at the entrance of a cavern while Captain Kirk and Nurse Chapel are led by Dr Brown to meet Dr Roger Korby. All is never what it seems in star trek. The music steps up a few beats and a strange creature steps out from within Exo's shadows. Unfortunately Raybourne meets Ruk, an ancient, advanced 'old one' left over from a byegone era. Android Ruk does his job only too well and protects! 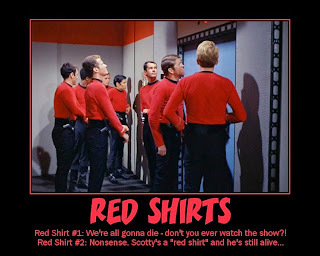 To roll in with some cosmic festive fun heres a list of Redshirts that fell honorably during Enterprise duty . Can you tell which ones survived Captain Kirk's reign of exploration and LIVED? Who escapes a court martial but is later killed by a Ceti Alpha V creature? 1. Lieutenant Compton - 'Wink of an Eye' Ageing/Cellular damage. 2. Lieutenant Desalle - 'Arena', 'The Squire of Gothos', 'This side of Paradise', 'Catspaw'. 4. Ensign Garrovich - 'Obsession'. 5. Lieutenant Commander Giotto - 'Devil in the Dark'. 9. Lieutenant Kyle - 'Tomorrow is Yesterday'. 10. Yeoman Landon - 'The Apple'. 11. Lieutenant Mallory - 'The Apple'. Explosive Rocks. 12. Crewman Marple - ' The Apple'. Clubbed. 13. Lieutenant Marla McGivers - 'Space Seed'. Madness. 14. Crewman Montgomery - 'The Doomsday Machine'. 15. Ann Mulhall - ' Return to Eden'. 16. Lieutenant O' Herlihy - 'Arena'. Phasered. 18. Lieutenant Palmer - 'The Doomsday machine, The Way to Eden'. 19. Crewman Raybourne - ' What Are Little Girls made of?' Thrown off a ledge. 20. Ensign Rizzo - Obsession'. Salt Vampire. Holiday Long and Prosper, Trekkies and Trekkers. O is for the Outrageous Okona but who is he? In Star Trek TNG of "the outrageous okona" the USS Enterprise NCC 1701-D encounters an unidentified vessel on the viewscreen. Worf eyes glint as he zeroes in on the spaceships co-ordinates at sector 3, 9, 5, 6, mark 0, 9, 1. Datas sensors scan for lifesigns and locate one humanoid on an interplanetary cargo ship. All is not what it seems. Data's readout confirms a burnout in the inertial guidance system explaining the little spacecrafts erratic flightpath and unconfirmed final destination. Worf establishes hailing frequencies and Captain Picard allows the pilot, Thadiun Okona to beam aboard with the malfunctioning part. Data's estimates repairs will take seven hours and sixteen minutes. So far so good. After friendly banter between Okona and Picard, Okona and Worf, tough guy Okona hands over all his weapons including a long heavy knife. Its interesting to note nearly every TNG character, including Data (struggle with humor) gets serviced in this episode which isn't an easy feat for any writer. Meanwhile below decks, Okona is finally foot loose and fancy free, fraternizing with several Enterprise females. Remember Teri Hatcher from Lois and Clark and Desperate Housewives? Well as Okona's luck played out in 2365, he got real friendly with a B.G. Robinson in the Enterprise Transporter Room, if you know what I mean. Believe me, its the same dame. Isn't she sweet? At the time Hatcher starred as the transporter chief in her only (uncredited) Star Trek appearance, who freely submits to Okona's chatup lines. I can't believe the words "You have the majestic carriage and loveliness that could surely be traced back to the noble families who once ruled romantic lands with benevolent and tender hands." actually worked! Robinson was eating out of Okona's hand. In the end she's dishing out her room number! When two alien ships track Okona's flightpath co-ordinates, things get interesting for the Enterprise bridgecrew. Who stole the the Jewel of Thesia and impregnated Altec's daughter, Yanar? Picard needs answers fast! Enjoy you Star Trekking Trekkers and Trekkies. Hi Trekkers, Ive written a poetic flash fiction, hosted by Mark "Madman" Koopmans and Alex "Clone Me A" Cavanaugh Morgan "the Borg" Shamy, Stephen "Wormhole" Tremp and "Dont Mess with the King. "celebrating the 'Major of awesome levity" creator of A to Z! The guy that looks like a Don in his cool shades, Arleebird. I drew my inspiration from a sci-fi superhero, so have fun reading. Look out! Here comes Arleebird. Hes got super solarian wit. Does he have a drinking song? I guess you'll have to join in and sing along. Seeker and speaker for geek entities. He always gobbles the kiwi fruit. Loves to write and recite. Winning showdowns in the good ol' American West. Maybe Arlee's a super alien!